Bacteria and Fungi come under different categories; the former one is the prokaryotic cell while the latter one is Eukaryotic cells. Apart from this, there are many differences between them like bacteria need a host to live, and they can be autotrophs as well as heterotrophs, whereas fungi grow their own and are heterotrophs which depend on others for their food. Bacteria do not have nuclear membrane enclosing nucleus, while Fungi (eukaryotes) have well- defined nucleus surrounded by the nuclear membrane. Prokaryotes and Eukaryotes are the two major umbrellas of classifications under which all the organisms are kept. Prokaryotes are the most primitive type of microorganisms, which are single-celled and lack many organelles, while Eukaryotes evolved from prokaryotes only but they are multicellular and contains all organelles with the specific function. Bacteria and Fungi shares some similarities also like, like they both reproduce and are living, they both can be parasitic and are microscopic too. Below we will discuss the general differences between both the microorganisms, with their different features. Meaning Bacteria are the most ancient organisms present till date. They are unicellular, prokaryotic, having simple cell structure. Fungi are the multicellular, eukaryotic organisms with complex cell structure. Cell lacks organelles. Organelles present. They lack the nucleus. Nucleus present. The cell wall is made up of peptidoglycan. The cell wall is made up of chitin. Cell Membrane Present below the cell wall. Present. Shapes Have three distinct shapes (spiral, round, and rod shape). Spiral - Spirella. Vary in shapes, but most of them are in the form of the thread-like structure called hyphae. Mode of reproduction Asexual. Can be either sexually or asexually. Motility Move through flagellum. They are non-motile. Mode of nutrition Can be autotrophs, but usually heterotrophs. Heterotrophs, usually feed on the dead and decayed matter. Host They do not need a host to grow. They grow their own. Derive energy from Bacteria obtain energy from sugars, proteins, and fats. Fungi obtain their energy from the used and pre-existing sources present in an environment. Disease caused by them Tuberculosis, rabies, leprosy, tetanus, diphtheria, strep throat, leprosy, pertussis, cholera. Athlete's foot, aspergillosis, aspergilloma, allergic bronchopulmonary, etc. Bacteria are prokaryotic microorganisms, considered as first organisms on earth evolved around 3.5 billion years ago. They can be either autotroph (which can prepare their food by the photosynthesis process or chemosynthesis) or heterotrophs (which depends on their host for nutrition). Bacteria exist in three shapes which are spherical (e.g., cocci), rod-shaped (e.g., Vibrio), and spiral (e.g., Spirochetes) and reproduce asexually by binary fission method or by conjugation. They are useful in releasing nitrogen to the plants, in decomposing organic matters, used in the fermentation process for making cheese, curd, and yogurt, though sometimes causes illness (tuberculosis, salmonella, strep throat), spoiling of food and contamination of water. Glycocalyx – The layer of glycocalyx work as a surface receptor, and also safeguard the cell wall. Nucleoid – It is the place where the genetic material (DNA) is stored into the condensed small packet. Pilus – It is a hair kind of hollow attachment found on the surface of bacteria. Pilus is used in transfers of DNA to other cells during the cell adhesion. Mesosomes – Mesosomes are helpful during cell respiration, They are considered as the extension of the cell membrane, unfolded into the cytoplasm. Flagellum – Flagellum is helpful in cellular movement, these are attached to the basal body of the cell. Cell Wall – Cell wall is known for providing rigidity and support to the cell. Fimbriae – Fimbriae are the small hair-like structure, helpful in attachment to the surface and other bacteria while mating. Inclusion/Granules – These particles supports the storage of glycogen, carbohydrates, phosphate, fats that can be used when needed. Ribosomes – These are tiny particles and play a vital role in the synthesis of protein. 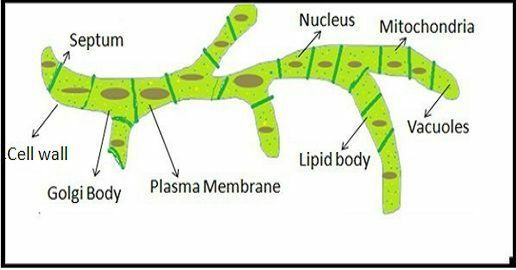 Cell membrane – It is the thin layer of protein and lipids, which present around the cytoplasm and check the flow of materials through the cells. Endospore – It protects the cell from harsh conditions. Prokaryotes can be differentiated into two parts, on the basis of the amount of peptidoglycan present in their cell wall; Gram-positive and Gram-negative bacteria. The Gram-positive bacteria contains a large amount of peptidoglycan in their cell wall while the Gram-negative bacteria has the thin layer. Fungi are the eukaryotic organisms, which can be unicellular (yeasts) or multicellular (hyphae), evolved 900 million years ago and derived from protists. They exist in the thread-like structure called hypha when these hyphal structure grows and form a thick mass; it is called mycelium. Fungi are heterotrophic organisms, and consume organic carbon for their nutrient. They secretes hydrolytic enzymes, by spreading in soil and rotten wood, feeding off the organic remains. As they obtain their nutrition from dead and decaying materials, they are considered as saprophytes. Fungi reproduce sexually as well asexually, by developing branches, fragmentation, budding or by spores formation. Some fungi are used for making antibiotics (penicillin), some are used as edibles and used for making bread, but they are also responsible for some plant and animal diseases may spoil food also. Nucleus – DNA (genetic material) is stored in this and helps in protein synthesis and ribosomes. Cytoplasm – Cytoplasm is the location of other organelles, and metabolic activities take place here. Golgi Apparatus – Its function varies but helps in the sorting of lipids and proteins and modifications of the proteins. Lysosomes and peroxisomes – Active in degrading foreign particles. Endoplasmic Reticulum – It helped in the transportation of the materials like lipids and proteins and attached to the nuclear membrane. Cell Wall – It provides proper structure and shape to the cell as well as support. 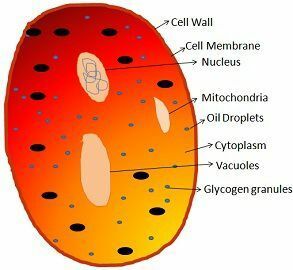 Cytoplasmic Membrane/Plasma Membrane – It is a semi-permeable membrane, surrounding cytoplasm and work as the barrier of the cell by checking the entry and the exit of molecules. Ribosomes – Help in the synthesis of protein. Prokaryotic and Eukaryotic are the two categories under which organisms are categorized, both bacteria and fungi both being microscopic organisms have the basic difference as bacteria are kept under prokaryotic cell and are unicellular which means that they do not have the well-defined nucleus and other cell organelles while fungus is categorized as eukaryotic, multicellular organisms which have well- defined nucleus, with other defined well-defined organelles. Bacteria exist in three shapes like the rod (bacilli), spiral (spirilla) and rounded (cocci), while Fungi may vary in shapes and are in the form of the thread-like structure called hyphae. Bacteria are autotrophs as well as heterotrophs and obtain their energy from sugar, proteins, and fats, while Fungi are heterotrophs and obtain their nutrition from dead and decay, hence called saprophytes. Bacteria can be useful in fermentation process, decomposing of organic matters, in releasing nitrogen to plants, and harmful in causing tuberculosis, leprosy, rabies, tetanus, diphtheria; while Fungi are helpful in making antibiotics (penicillin), used as edibles, and in making bread while they cause certain disease in plants and animals and can spoil food. Food sources for them are almost the same. Both contain DNA (Deoxyribose Nucleic Acid) as their genetic materials. They both are responsible for causing disease or infection to the body, as bacteria is responsible for tuberculosis, pneumonia, throat infection, stomach related problems, while fungus causes ringworm and athlete’s foot. Both of them contains cytoplasm, cell wall as well as the cell membrane. From the above discussion, we can say that the microorganisms which are found everywhere, can sometimes be harmless or harmful. They both have different cellular makeup and differ in their functions too. In ecology also they play the important role where some bacteria help in the fermentation process, fungi help in making antibiotics while some may be harmful by causing disease like tuberculosis, strep throat, skin infection, athlete’s foot.